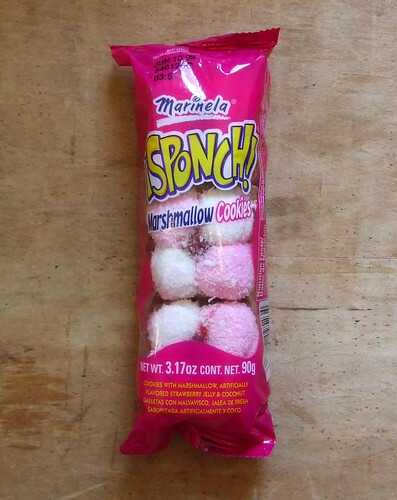 Sponch is an..., originally uploaded by staceyjoy. If you click on the photo uploaded by staceyjoy, you'll see the economy size in the comments. How are these? Anyone out there addicted? Are they squishy or solid? Is it coconut on top or just sugar? And the real question, is there a chocolate variety? Oh! They look so natural and healthy :) (I'm not judging, junk food is my favorite food!!) Are they covered in coconut? Pink + coconut = awesome. It's a cookie topped with 4 marshmallows, a dab of jelly, and coconut. It's pretty good, actually. Especially since the name frightened me.